I hope you will join me there and I thank you for your support these past four years. 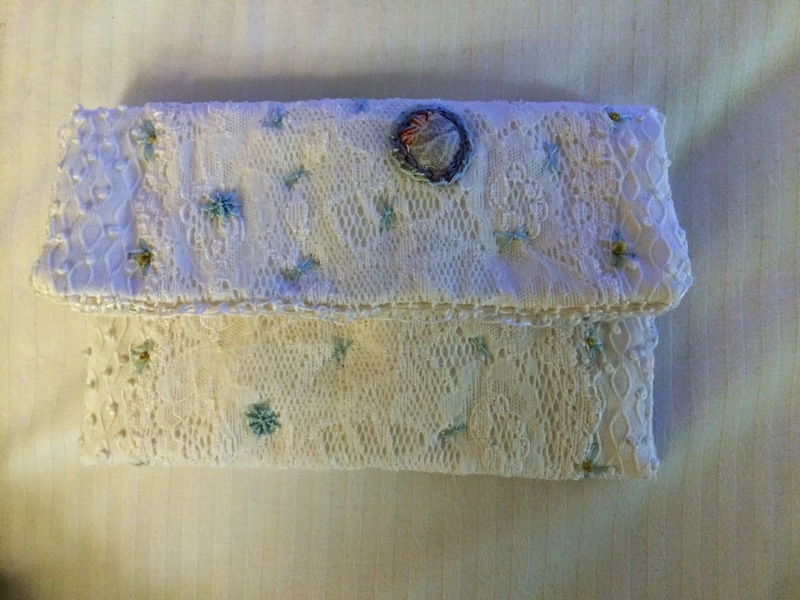 This is a small case that I made for carrying some of my needles, small scissors, etc. for my hand-stitching projects when I travel. It was very helpful on my trip to Colorado last week. I suspect I will look on it fondly as my web and buttonhole stitches improve with practice! 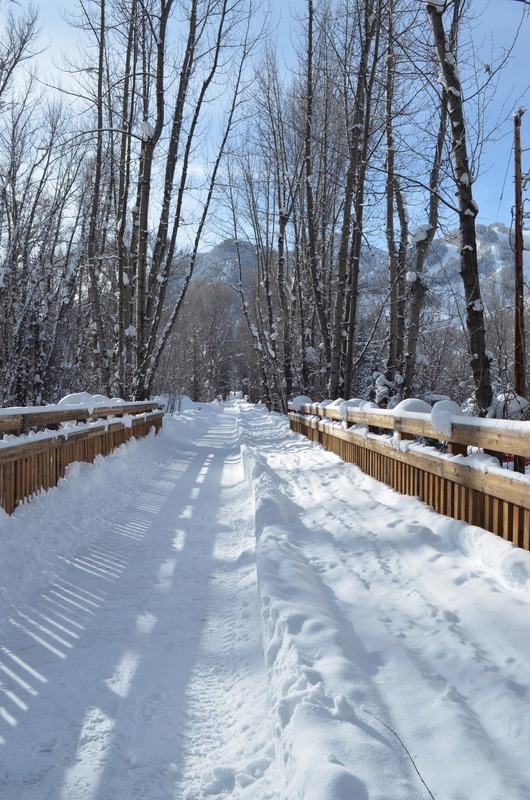 There was 36 inches of snow in Aspen in 24 hours. While it created havoc with my flights, once I did get there, the snow was just beautiful. I got out to take some photos on my 'morning off' from child care. 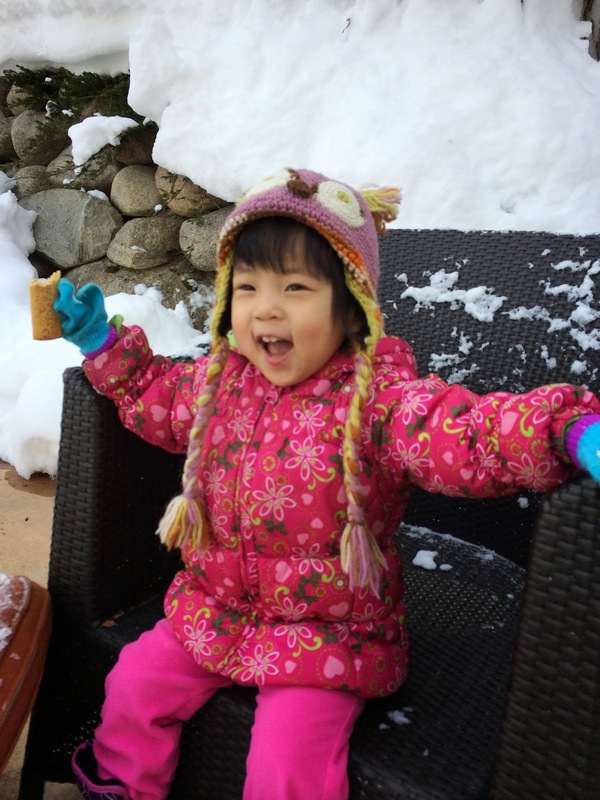 The most precious part of my trip was sharing a week with my granddaughter. It is impossible to spend time with a two-year-old and not be reminded of how great it is to be able to be 'in the moment' and experience sheer joy in just being. Check out Off the Wall Friday to see what others have been up to. 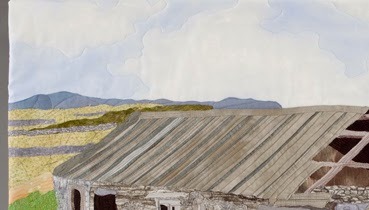 While I totally enjoy creating representational landscape quilts, often the hardest part for me is the sky. I have collected many, many blue fabrics that help capture the texture and tones of a cloud filled sky. 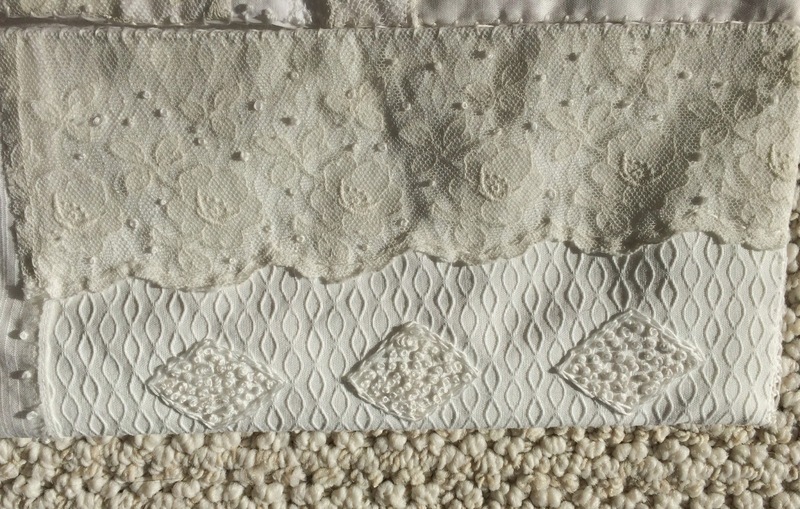 Once the fabric is selected, the choice of free motion quilting is often even more problematic. I have tried various approaches. In the three examples below, I actually cut out the entire sky in the second and replaced it! 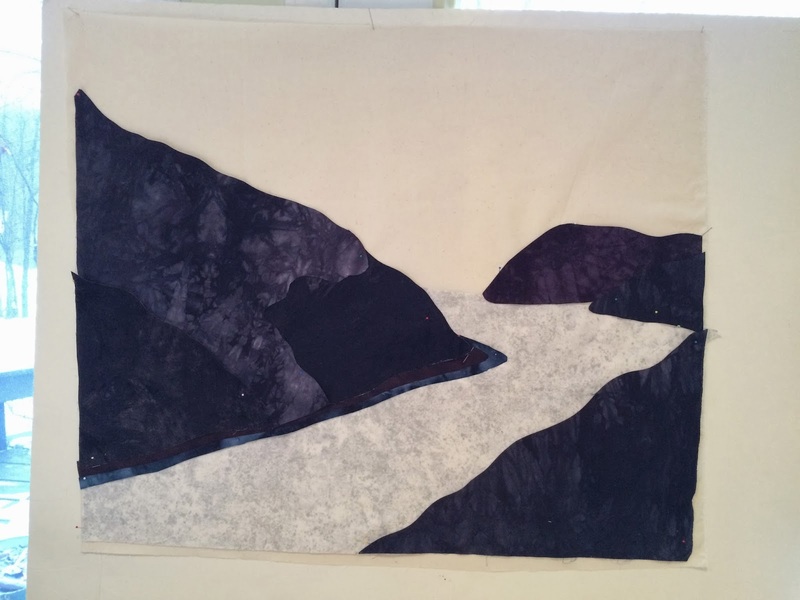 My latest project is adapted from a beautiful photo of the Boundary Range in Alaska by Mark Adamus. The photo captures an arctic flow through the mountain range with the sun reflecting beautifully off the peaks. I have been having a great time creating the mountain tops. But, of course, there was the issue of the sky. Often I leave it till last, but I decided to tackle the issue early on in my design. A blue sky simply wasn't going to cut it this time. As I searched through my stash, a piece of hand dyed cotton I acquired from Lisa Walton years ago jumped out at me. I compared the highlights in my photo with the hand-dye - I could see a relationship! I started cutting and playing with arrangement. 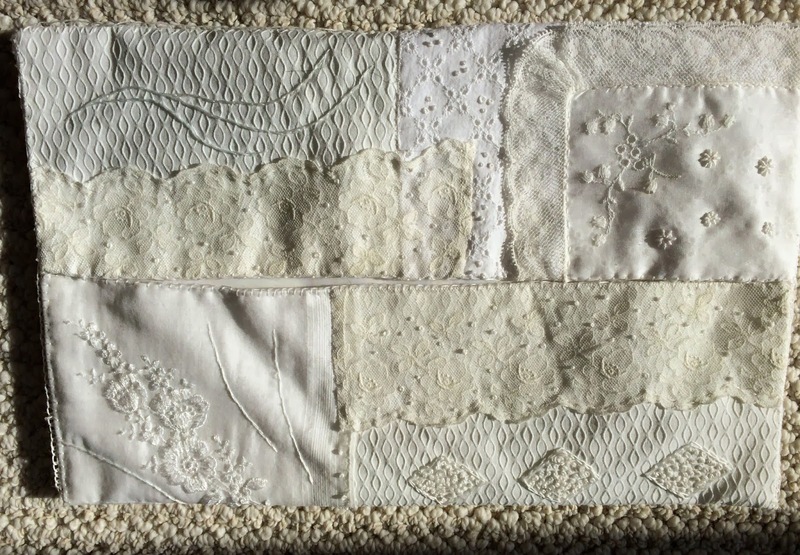 I have been enrolled in Karen Ruane's 'non-class', Simply Stitch 3, for the past few months. With no set course requirements, it has been a perfect venue for me to learn a bit about hand stitching. Through the wonders of video, it is as though you are sitting on Karen's shoulder while she stitches her own projects and shares her thought processes. It is a gentle way of learning and I have thrived. Karen is ever so willing to answer questions readily via email. In addition, Flickr is used as an online venue where you may post photos and receive feedback from Karen and the other 60 'students' located across the globe. Early on, I decided that the best tact for me was to pick a project and work on it. I decided to create a 'pouch', as Karen terms them. She works primarily in white, so I decided to follow her lead. I imagined it would help me appreciate the art in her world. It was a fun experience. 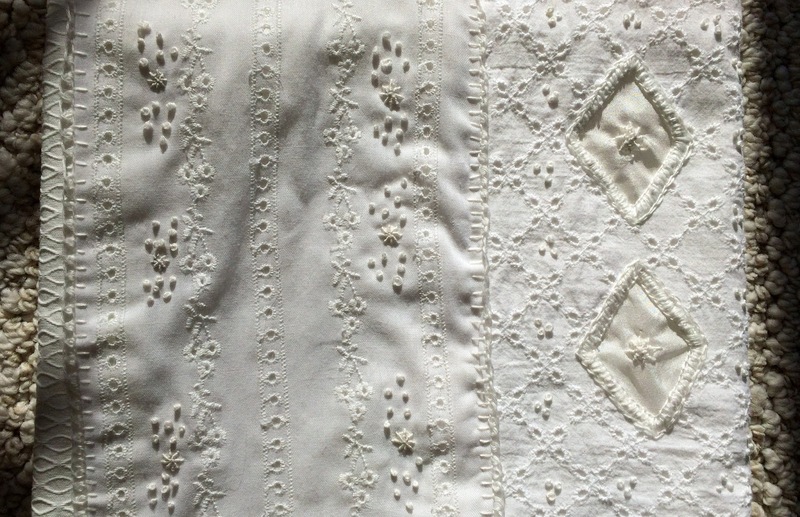 The beauty is in the individual stitches and the interplay of the piecing. 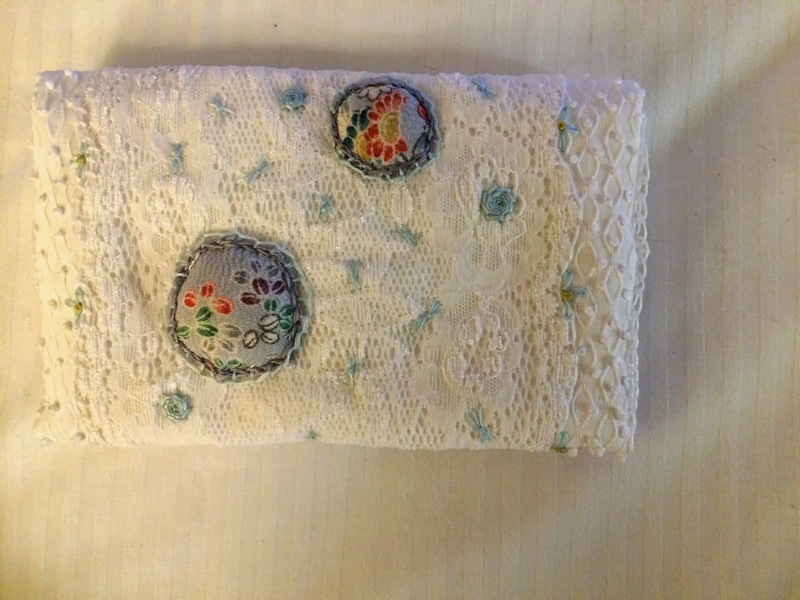 As you can see from the following photos, even a beginner can create some beautiful effects with just a few well-placed stitches and some beautiful fabrics. Half-way through the first month of 2014, I am beginning to feel a certain comfort level with my life. I know, that only means that upheaval is likely! The Visioning Project revolves around visualizing goals and dreams - and making them happen. By making a public commitment, the artist is inspired to achieve a specific goal. Some goals are very specific, such as gaining a private commission, getting gallery representation, or selling a work. Other goals are more developmental: building a cohesive body of work or producing work regularly. The Visioning Project members are wonderful in helping each other with support, networking, and resource information. If you are member of SAQA, you may want to consider joining. The first month of the year is a great time to set out goals for yourself. I have been busy with my own work this month as well. Here is a glimpse of Moutains and Rivers as it hangs on my design wall. I am particularly pleased with how the gradations of the mountain colors turned out. You have no idea how difficult it was to select the right pieces. I had ordered two sets of 'black' gradations. Neither turned out to be really black but, in the end, that was okay. One set had a definite maroon hue to it but that allowed me to juxtapose the maroon gradations with the grey/blue ones and create more movement. I will be on the road quite a bit over the next few weeks so this piece will be sitting for a bit before I add snow and ice flow. That is actually a 'good' as I have some ideas percolating on those phases and they need time to brew! I have linked this post to Off the Wall Friday so check out what other artists have been up to this week. It's a new year and I am looking forward with excitement and a good deal of anticipation. 2013 was a major year of transition. Our beautiful granddaughter will have been with us for a full year at the end of this month. My life has felt at times like a perpetual transition from one trip to another but I wouldn't trade it for anything. 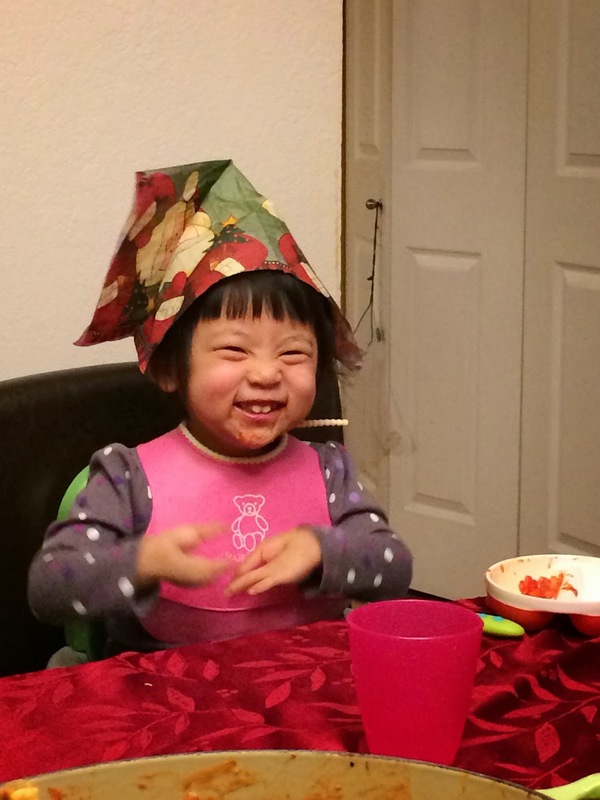 She has filled our lives with joy and laughter. 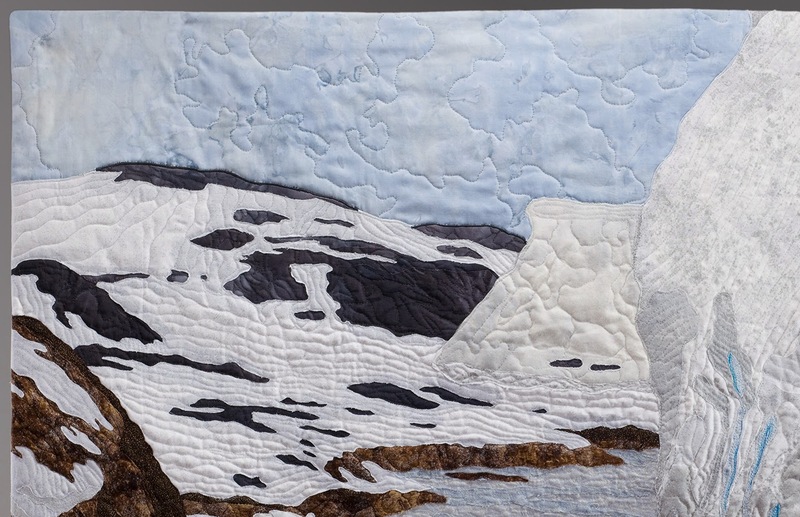 As 2014 begins, I have begun work on a new art quilt in what I am calling my Arctic/Antarctic series. Here is a sneak peak at the start. Hand stitching looms large in my plans for 2014. 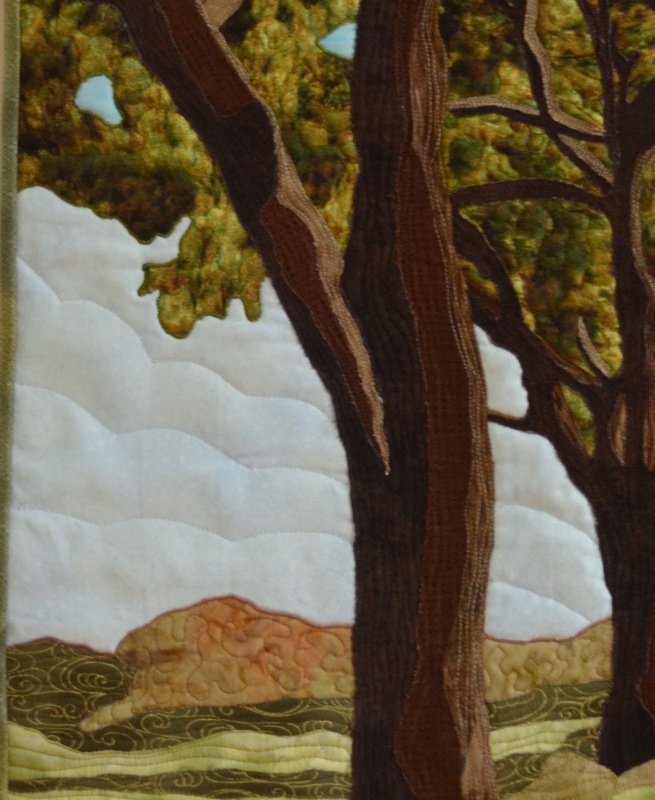 I have already signed up for continued study with Karen Ruanne through Simply Stitching 4. A bit of time each day is consumed with perfecting stitches. 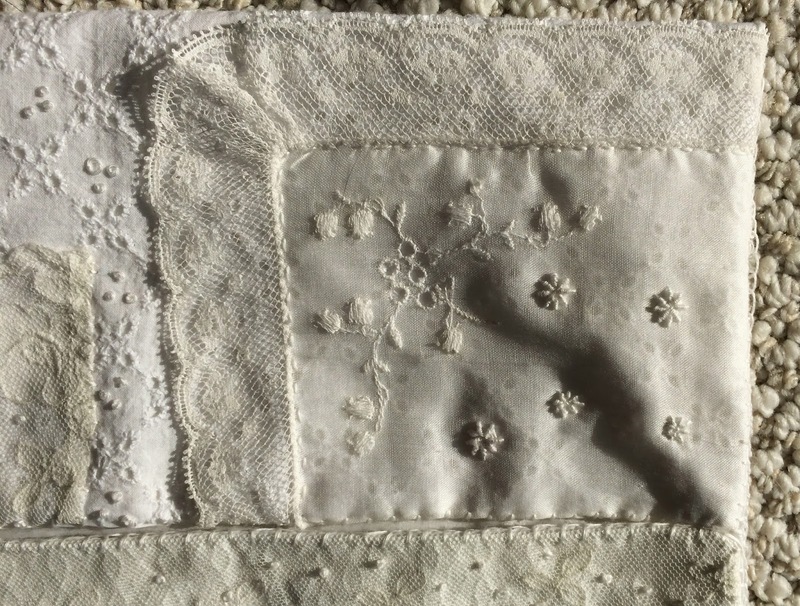 While French Knots roll off my needle easily, those bouillon knots are not yet up to snuff for inclusion in a work. I will have completed my first 'sampler' pouch soon and will be sharing. In the last few weeks of 2013, I wrapped up some UFOs from the fall. Two pieces are away at the photographers. 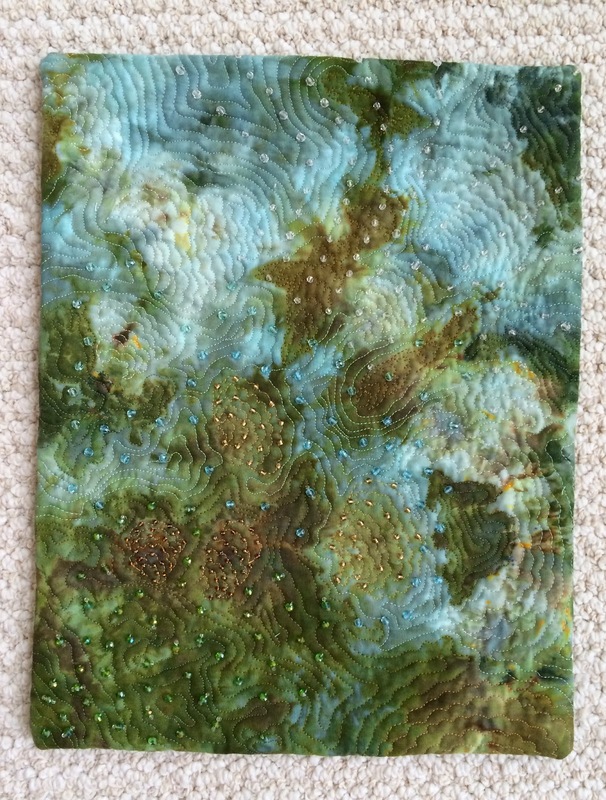 The third is a smaller piece that I created from some ice dying last summer. 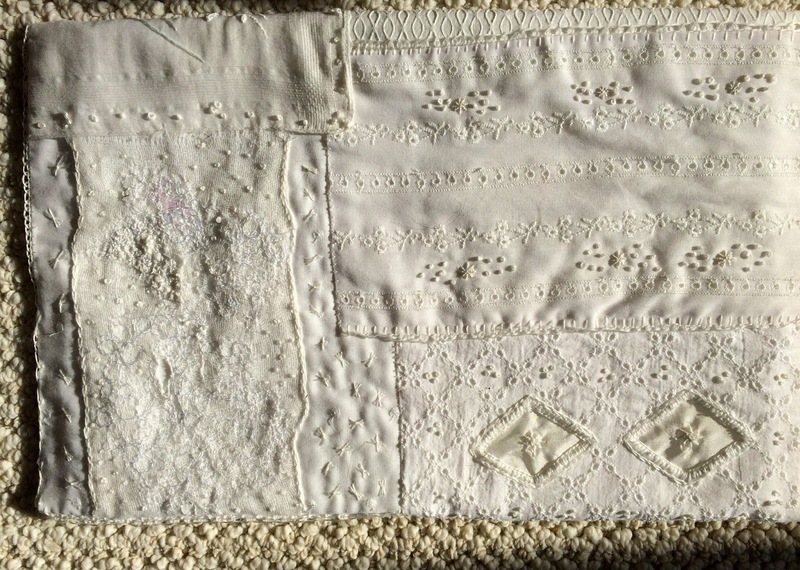 About ten years ago, I was picking up again on my interest in fabrics and quilting. 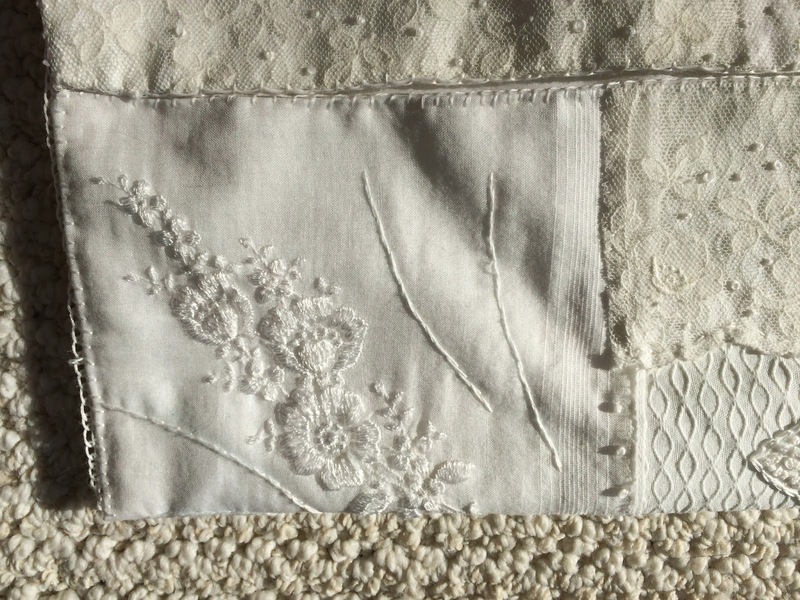 At the same time, Trish Straight opened a small storefront quilting store on our Main St. that she called 'Ivy Thimble'. 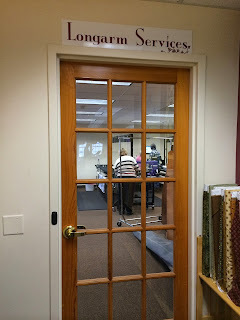 Our paths had crossed many times before that as our children progressed through the local school system so it was nice to find a friendly face when I ventured in to one of my first quilt stores. Through the years since then we have both watched our children grow into full fledged adults and pursued our own paths in the fiber world. Ivy Thimble moved to a second location as it expanded…….I began entering shows…. Now, as 2014 emerges, it filled me with great delight as I finished a run in our town to stop in at the brand new location of Ivy Thimble. 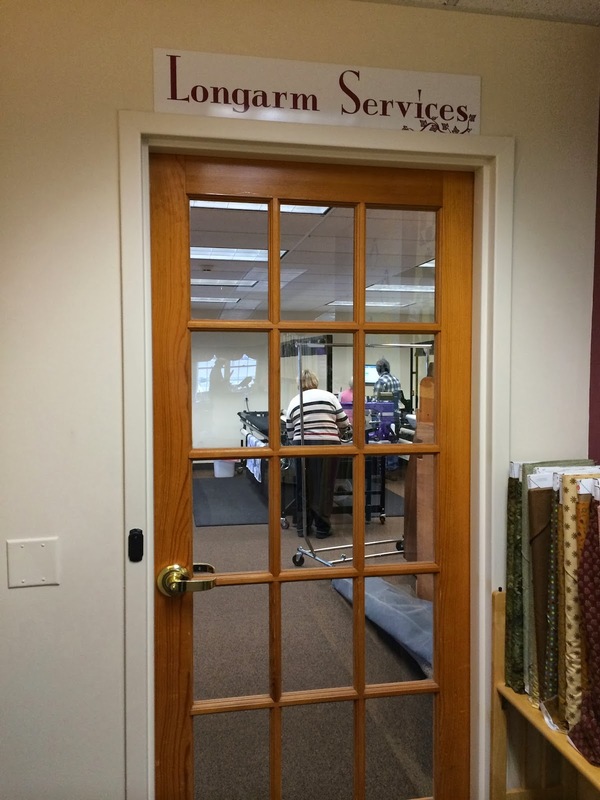 Over the years, Trish outgrew her second location as she expanded the services offered by Ivy Thimble and the lines of fabric carried. As important to me, during these years, she reached out in every disaster to sponsor a drive to support those in need, not to mention the food drives for our local community. As I walked about in the new huge location for Trish's store, I had to smile. 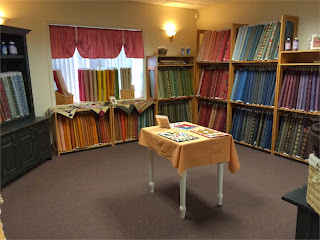 I see many quilt stores in my travels, but none come close to Ivy Thimble in its new location. There are actually theme rooms for fabrics! The classrooms are spacious and there is an entire long arm section. I can't help but feel so happy both for Trish and for our local community that we have her. It is really wonderful to see someone who has given so much succeed in their dreams.